An Ottawa woman is dead from a heart attack caused by the stress of an armed robbery. 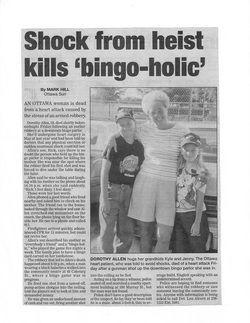 Dorothy Allen, 58, died shortly before midnight Friday following an earlier robbery at a downtown bingo parlour. She'd undergone heart surgery in May of last year and had been told by doctors that any physical exertion or sudden emotional shock could kill her. Allen's son, Rick, says there is no doubt the person who held up the bingo parlour is responsible for killing his mother. She was near the spot where the robber fired his first shot and was forced to dive under the table during the heist. Allen said he was talking and laughing with his mother on the phone about 10:30 p.m. when she said suddenly, "Rick, I feel dizzy. I feel dizzy." Allen phoned a good friend who lived nearby and asked him to check on his mother. The friend ran to the house, looked through window and saw Mrs. Allen stretched-out motionless on the couch, the phone lying on the floor beside her. He ran to a phone and called 911. Firefighters arrived quickly, administered CPR for 15 minutes, but could not revive her. 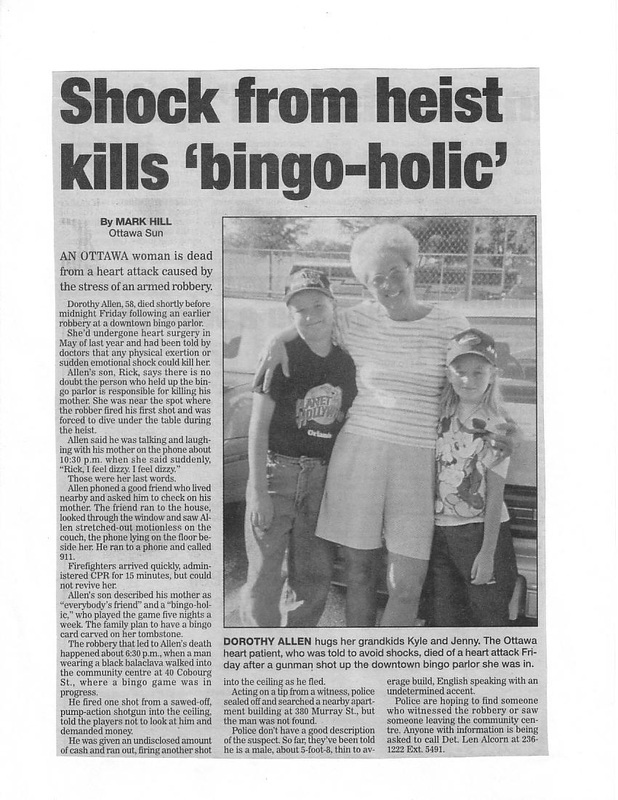 Allen's son described his mother as "everybody's friend" and a "bingo-holic," who played the game five nights a week. The family plan to have a bingo card carved on her tombstone. The robbery that led to Allen's death happened about 6:30 p.m., when a man wearing a black balaclava walked into the community centre at 40 Cobourg St., where a bingo game was in progress. He fired one shot from a sawed-off, pump-action shotgun into the ceiling, told the players not to look at him and demanded money. He was given an undisclosed amount of cash and ran out, firing another shot into the ceiling as he fled. Acting on a tip from a witness, police sealed off and searched a nearby apartment building at 380 Murray St., but the man was not found. Police don't have a good description of the suspect. So far, they've been told he is a male, about 5-foot-8, thin to average build, English speaking with an undetermined accent. Police are hoping to find someone who witnessed the robbery or saw someone leaving the community centre. Anyone with information is being asked to call Det. Len Alcorn at 2361222 Ext., 5491.